LAWRENCEVILLE, Ga. – Atlanta audiences are invited to step into a splintered world of strange imaginings as Aurora Theatre presents the world premiere of the femme fantasy story SWEEP, February 10 –March 5, 2017! The magical quest, written by rising Latina playwright Georgina Escobar, follows two sisters’ attempt at resetting history’s imperfections by hunting both biblical and modern-day targets through a set of alternate realities called the “multiverse.” Imaginative and adventure-filled, this zany, time-traveling escapade is a can’t-miss production for the New Year! “Multiverse” hit women, Luna and Siri, are armed with deadly broomsticks, sweeping the world’s mistakes into oblivion one human flaw at a time. But when they fail to clean up Adam and Eve’s apple situation, the two superhero sweepers find themselves unleashed on a cosmic journey through time. With Dragon Con sensibilities, this world premiere production is rife with the humor and adventure of a great graphic novel that will leave audiences stunned and surprised. SWEEP will star some of the region’s leading actors, including Candice McLellan (Siri, Peter, and Grettlegrott), Jasmine Ellis (Luna), Cody Russell (Adam, John the Baptist, and Ralph) and India Tyree (Eve, Hessa and Theresa). Throughout the 90-minute performance, the talented cast will portray multiple characters, adding, even more, entertainment to the fantastical plot. 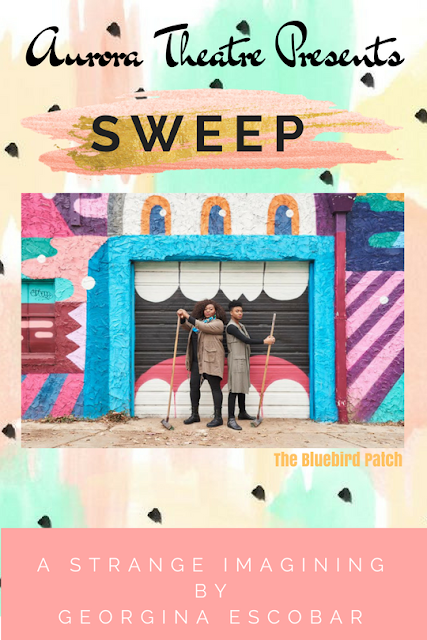 Recommended for theatergoers with vivid imaginations, SWEEP will play February 10 –March 5, 2017. Regular show tickets range from $20-$30 and can be purchased online at bit.ly/SWEEPTickets or by calling the Box Office at 678-226-6222. For more information on SWEEP or other Aurora Theatre programming, visit auroratheatre.com. Under the artistic leadership of Co-Founders and Artistic Directors Anthony Rodriguez and Ann-Carol Pence, now in its 21st Season, Aurora Theatre produces professional live entertainment to suit everyone’s taste. Aurora Theatre is home to over 650 events each year. Two series of theatrical productions, the Peach State Federal Credit Union Signature Series and the GGC Harvel Lab Series, are comprised of the biggest Broadway plays and musicals alongside exciting contemporary theatre. Additionally, Aurora produces concerts, stand-up comedy, children’s programs, metro Atlanta’s top haunted attraction Lawrenceville Ghost Tours, as well as Atlanta’s only professional Spanish language theatre, Teatro Aurora. Aurora Theatre is a world class theatrical facility with two performance venues. Nestled on the square in historic downtown Lawrenceville, Aurora has FREE attached covered parking and is surrounded by restaurants and shops. Aurora Theatre has garnered numerous accolades highlighted by recent achievements that include a 2016 Governor’s Award for the Arts & Humanities, winner of seven 2016 Suzi Bass Awards, Creative Loafing’s “2010 Best Theatre Company,” Georgia Trend Magazine’s “2011 Best Places to Work in Georgia,” Atlanta Business Chronicle’s “2012 Best Places to Work”, Atlanta Magazine’s “Best of Atlanta 2013”,Georgia Hispanic Chamber of Commerce’s 2014 President and CEO Award for Excellence in Arts, and Gwinnett Chamber’s 2015 IMPACT Regional Business Award for Hospitality .